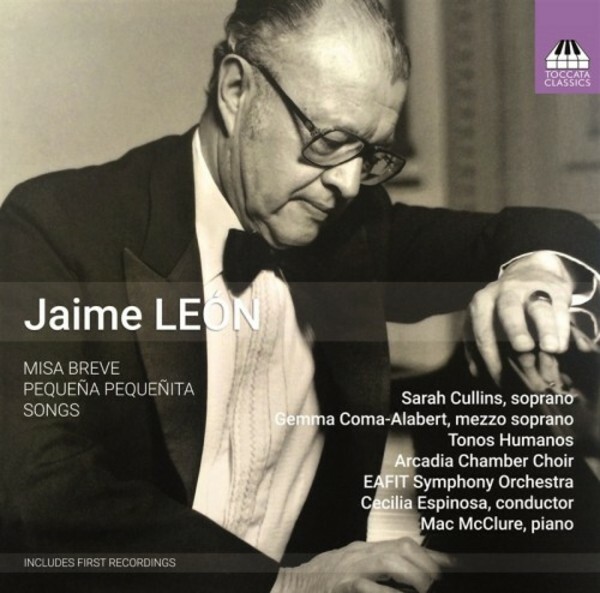 Born in 1921, Jaime León is now the Grand Old Man of Colombian music, and this is the first internationally released CD dedicated to his music – a long time to wait. This release is a truly international one, with American and Spanish soloists, an American pianist and Colombian conductor, with soloists, orchestra and choirs on a London-based label run by a Scotsman. The American soprano Sarah Cullins recently returned to the USA after years as head of the voice programme at the Universidad Central in Bogotá, her base for her operatic appearances in Latin America. The Spanish mezzo soprano Gemma Coma-Alabert has sung widely in opera houses all across Europe. The Colombian conductor Cecilia Espinosa Arango is Director of the Music Department of the Faculty of Arts at the University of Antioquia, and Musical Director at the Musical Institute Diego Echavarria, founding the School of Music and serving as Head of the Department of Music at the University EAFIT in Medellín. The American pianist Mac McClure is internationally recognised for his in-depth knowledge of Spanish music. He has recorded more than 40 CDs for Columna Musica.